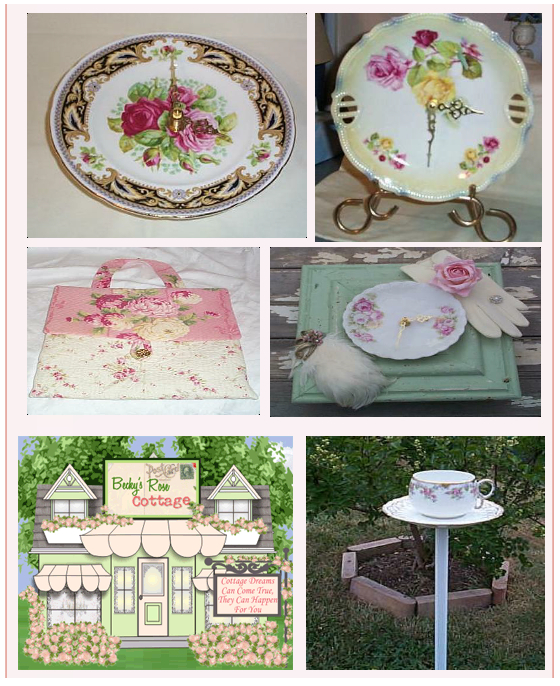 Becky's Rose Cottage has beautiful hand made clocks she makes from vintage china plates. A specialty she enjoys, turning yesterdays timeless pieces of pretty china into functional clocks that decorate your home. Her talents don't stop there she also loves to sew and makes these beautiful one of a kind handbags to make any woman feel extra special. Outside the home she decorates her garden with bird feeders she creates from tea cups and saucers. Imagine what a treat it is for a bird to see food inside this beautiful garden delight!